Regardless of whether you're celebrating the holidays, the arrival of spring, or merely enjoying nature's harvests we have the decorative seasonal welcome mats you've been looking for, including Spring, Summer, Autumn, and Winter themes. Among our seasonal collection, you will find a wide range of holiday doormats in Valentine's Day, St. Patrick's Day, Easter, Halloween, Thanksgiving, and Christmas themes to invite your guests inside in true holiday spirit. The greatest thing about our recycled rubber MatMates doormats is that you are able to switch them out as the seasons change using our unique insert trays. 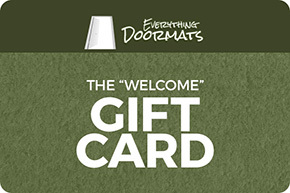 Our holiday and seasonal doormats are all made from high-quality recycled rubber to minimize environmental impact and ensure welcoming comfort and years of reliable service. Get any holiday doormat or seasonal welcome mat and make a relevant impression with all your guests today!